With a programme containing no less than six urban planners and architects I wasn’t sure what to expect from TEDxEQChCh, the hastily-organised conference to “reimagine the future of Christchurch”. Fortunately there was a diverse range of topics explored and I found the day inspirational. When I say “hastily-organised” today’s event was still run to the high standards expected of a TEDx event which is amazing considering both the short timeframe, not to mention that all the volunteer organisers were still reeling from the devestating quake in February when they started pulling this conference together. My thanks go out to Kaila, Raf and the rest of the team behind TEDxEQChCh – I am very grateful for their efforts; today will be one of the highlights of 2011 for me and for Christchurch. The ideas, vision and encouragement that has been poured into the citizens of Christchurch today by local and international speakers and experts through TEDx will surely stand us in good stead. As James Lunday an ex-Scottish urban designer now living in Christchurch implored, do we really want to rebuild what we had? Or as ex-mayor of San Francisco Art Agnos said “do not automatically assume that things should be put back the way they were”. Christchurch was (and still is) a beautiful city but it was starting to go off the rails. What once was a good structure, a clear plan, was deterioriating and giving way to heartless urban sprawl. James took us through a journey of Christchurch from 1856 starting with the ‘Black Map’ through 1877, 1922 and to today showing how residential development was choking the life out of this city – and now we have a chance to reign it in. He talked about neighbourhoods and villages and the inadequate distribution of community focal points within each and every neighbourhood. The few satellite public spaces that do exist are mere shopping malls. We need to do so much better. James advocated keeping cars out of the CBD. Entirely. No cars within the 4 Avenues. Bike and foot traffic only with boulevards; getting rid of the ugly buildings … in fact he even asked for permission to run into the CBD with a fistful of red stickers and tag all the ugly buildings for inclusion in the demolition! Rediscover nature. Unbury the covered rivers. Build a network of green parks that course through the city. Discourage driving everywhere and encourage walking. Grant Schofield was also supportive of encouraging physical activity and creating safe places for our children to “free range” – but also pleading that we as a generation dial back the risk averseness. The benefit is propotional to the risk; take on more risk and there’ll be more benefit. Our risk averseness is leading to sedentary indoor lifestyles which is for the first time in history resulting in a generation with a lower life expectancy than their parents. Paul Downton from Adelaide talked about Christie Walk, a collection of 27 dwellings with essentially a shared backyard where they all meet and have a safe place for their kids to play. It’s high-density living without being high-rise, and has an fantastic high allocation of space to plants and gardens. It looked so beautiful, and it was social. The idea of getting people out of their houses and having a relationship with their neighbours also came up. People are the life of a city. As Hugh Nicholson – principal advisor on urban design at the Christchurch City Council – remarked after touring the “apocalyptic” Red Zone, a city without people is a designer’s worst nightmare. In a TED video the hilarious James Howard Kunstler talked about “places worth caring about” showing a few examples of failed attempts to create public spaces including the Boston City Hall Plaza. Devoid of human life. What’s the point? What a failure of design. What a waste of money and opportunity! And it doesn’t need to cost a lot of money, as Coralie Winn from Gap Filler demonstrated. As long as there are people then you can get away with throwing some astroturf on a recently demolished building site. Coralie also mentioned Renew Newcastle, Greening the Rubble and the Section 8 Bar in Melbourne. Gap Filler is not designed for temporary feel-good entertainment but is showcasing what is possible and how our city and our community needs public spaces – places that bring people together to meet and share and entertain or be entertained. Cameron Sinclair, co-founder of Architecture for Humanity, also focussed on the low-cost “just get it done” mentality with the AfH mantra of “Follow your heart. Break the rules. Get it built”. Think long-term but also remember that the people displaced from their ruined homes living in campervans do not care about 10-year visions; they just want somewhere to live and be able to get to and from their jobs so they can put food on the table. Cameron also introduced the idea of “urban acupuncture”; instead of looking at reconstruction at a zone level, take it down a notch and look at what can be done in each neighbourhood. Small things that improve the lives of residents across the entire city and show signs of recovery. Building is better than talking. Majora Carter would agree: just get your hands dirty and do it, because sometimes no one else cares about your plight. Art Agnos said that Americans don’t hear about Christchurch any more – it’s been overtaken by the disaster in Japan. Of the 40,000 ideas shared so far, Hugh Nicholson shared that the main themes coming out of the massive amount of input from the community is that people want more green public spaces, more pedestrian walkways, more trees … and less cars, busses and concrete. Then we went to the other end of the spectrum, the multi-billion dollar investments in orchestrating the development of entire cities. Karen Blincoe of Denmark spoke about cities being living entities with soul, heart, mind and body. The soul is that which has persisted throughout the ages – our culture, our past and heritage. The buildings are the body of the city, and they’ve taken a hit but the city can be healed. Perhaps Christchurch can be the first eco-city in the world? There have been attempts such as Dongtan which has been aborted. Masdar might be more successful but its schedule has been pushed back from 2016 to 2020 and possibly 2025. Sure, that sort of investment might appear daunting but what if Grant Ryan is right when he suggests that developing an iconic city could bolster local house values by a collective $37 billion? The return on investment is there. Karen also made mention of the Megacities on the move toolkit and The Transition Handbook. I didn’t take many notes for Dan Cullum’s presentation – but I loved his energy and stage presence, and if you’re a young person I suggest you check out the I Am Challenge. Hugh Morrison gave some sound advice with setting out a clear timetable for recovery and commencing rebuilding Christchurch – giving people some certainty in a world where there are so many unknowns. They can only make plans once they know what other plans are that underpin their decision-making, such as the Central City Plan and the actions of third-parties such as insurance companies. Sacha McMeeking recommended that we learn from the hui, a Māori meeting format that whilst can result in “rugged” discussion does actually work as a community consultation, collaboration and collective decision making mechanism. Paul Downton introduced “cultural fractals” and how the city as a whole is reflected in and reflected by its constituent parts. Patterns help semi-autonomous neighbourhoods take charge and ownership of how their local area is developed. This ensures that a city retains its culture and integrity and not break down into lifeless and coreless suburbs. One of my favourite presentations of the day was delivered by Helena Norberg-Hodge from Byron Bay, Australia. She spoke about how globalisation is killing our world and so few people actually want it. Left or right politics are irrelevant compared to the greater fundamental issue of global vs local. She likened the long reach of large overseas corporations to Predator drone warfare. It’s blind and heartless when you are so far removed from the battlefield. How can corporations be sensitive or even aware to the damage they’re causing when they’re thousands of miles away? Farmers are sick of competing on cost on a global market and they’re sick of having to standardise their product. So much food is wasted simply because it doesn’t fit the machines that are neccessary to process the massive amount of product that is moved offshore. Cut out the middle man, bring back the local farmers market and farmers’ profits will rise from below 10% to 100%, consumers will benefit from actual fresh produce and on cost. Food grown for a local market can manage a tenfold increase in productivity per unit of land … so it’s a win-win for everyone. And farmers markets offer yet another so badly needed forum for connecting with people and getting to know your community. In so many ways we’re looking to dial back the clock to the 19th century, but with a modern twist enabled by technology. Renewable resources, recycling waste, solar and wind power … but the most important thing are people. Do you even know who your neighbours are? As Helena pointed out “economists are ecologically illiterate”. This will never happen so long as the bean counters are in charge. They can’t see more than 2-feet in front of them. They can’t see that globalisation is hurting us, not benefiting us. That said, Helena did not advocate isolationism because we need global networks of knowledge to make this happen. But we need to stop shipping produce everywhere because when oil runs out we will lose our transport network. We need to become self-sustaining locally and be able to ride or walk to where we buy food and products we need. What can you do? What can I do? As I was saying to Danny Squires during one of the breaks, I’m not an architect or urban planner and it seems at the moment they’re the only people who can really do anything because of the scale of the problem and solution. I was heartned to learn that he as an architect has taken some inspiration from me and my blog posts on user experience design and design thinking. Although it would be good to have a vocation that is relevant and useful to the recovery and rebuild effort, everyone has something to offer even if not experts in urban design. Karen Blincoe said that it’s the Scandinavian way to consult with citizens and specifically the people who have to live and work in the structures architects build. Citizens are experts in how they live and what they need to lead satisfying and happy lives for themselves and their families. That is invaluable information for the authorities making decisions and people designing the new Christchurch. James Lunday would ask that I not use ‘rebuild’ and instead drop the ‘re’ and simply use ‘build’. Redesigning and rebuilding imply restoring the city to its pre-quake state which should not be our goal. We cannot waste the opportunity we have to merely restore Christchurch to the way it was because the city was and is on the same path as all cities across the world … they’re going to hit a wall sooner or later. Let’s not just recover from the earthquake but with a blank canvas of a CBD short one or two thousand buildings and much reconstruction work needed across the region let’s make Christchuch a city that our children and our children’s children will want to live in, that will see them survive the global challenges ahead. Matt Taylor has done a fantastic job of summarising all the talks including the TED videos. 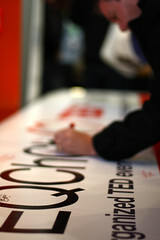 The photo at the start of this blog post is of a larger banner with “TEDxEQChCh (hearts) TEDxTokyo”. TEDx attendees were invited to write messages of love and support to everyone in Japan. TEDxTokyo was held today the same day as TEDxEQChCh. The banner will be sent over to Japan soon. Thanks for this wrapup, Nathanael. What a great infusion of energy and ideas for the city in the aftermath of the earthquake tragedy. Well done to all the organisers and the people who made it happen on the day. I can’t wait for the talks to go up! Helena is absolutely on the money – Christchurch has a golden opportunity in the wake of this disaster to design for the post peak oil future. Again, Christchurch could be an exemplar of citizen-designed development, from the bottom up, rather than the top-down ‘master plan’ approach, which I’ve always found a bit worrisome and which may be why Dongtan and Masdar have stalled. One of the big myths about green/ecocities is that they are just about green tech. It’s not. Ecocity development puts people at the centre of the process, and considers the ethics of how it comes into being, where its materials, finances etc are sourced. There are some terrific ideas coming out of the collaborative consumption movement – would highly recommend Shareable http://www.shareable.net for lots of great ideas on shared space, and lives. People, after all, live in cities because of access to exchange. Why then, does the design of our cities promote increasingly compartmentalised and separate forms of living? The attraction of a place like Christie Walk may well be its ‘green’ features/tech, but its the aspects of being part of a community that are a real magnet. The idea of co-housing has always appealed to me – you *can* elect to remain in your private space to eat, but a common house where you might be rostered on to cook a meal for 20 people once a fortnight, and the rest of the time a cooked meal appears – bliss! How many time-pressured people would love this? But we persist with the cult of hyper-individualism. How can design be greener AND make people’s lives easier? That last paragraph – what a beautiful gesture. That’s a good summary Nathanael. Thanks for the effort. Your blog does add quite a lot to my own notes. It’s interesting that the main things you took away were not the same things I focused on. For instance, of all the local speakers I thought Sacha McMeeking was the outstanding presenter. I’ve written brief notes about her presentation in two places. Christchurch should NOT be rebuilt. What we need is a NEW Christchurch based on different principles, and focused on future needs and realities. James Lunday and Helena Norberg-Hodge as you said in your report, gave us details about how to do that. Thanks John, and thanks for reminding me about the neighbours forum – I joined up 4 March but haven’t participated yet; will do that now! Interesting read, I think its on the people of Christchurch and us New Zealanders too – to demand public consultation for the rebuild. I’d really like to see an international urban architectual competition sort of like what they did for the World Trade Centre memorial & site rebuild. Good review thanks Nathanael. It was a great day and inspiring to hear some of the ideas… Never thought I would see the hugs and pledges but wasn’t it great! But overall an inspiring and positive day with a very passionate Art Agnos finishing it off in a very American way, which was well received! Good point Steve, I didn’t really consider the economic feasibility too much on Helena’s angle but you’re absolutely right – with the current composition of NZ primary production it just wouldn’t work; we’d need to drastically alter & diversify our output to make it internally sustainable within NZ, let alone Canterbury. I guess my response was more emotional; being a foodie and cook I just love the idea of farmers markets featuring prominently in public places and neighbourhood (village) centers. I have similar feelings towards Helena Norberg-Hodge’s talk as Steve. While I am not anti-globalisation, I personally think that localization for food as much as possible is important for the global environment and local communities. It think the subject deserved a place in the discussion on CHCH. However, not adjusting her talk to make it directly relevant to the CHCH situation was a bad mistake. It just felt like preaching and she lost me with endless unsupported stats. I loved Helena’s presentation – absolutely agree with every single word she said, and I think it is totally appropriate to not just Canterbury but also New Zealand. Her whole point was that we need to be considering things bigger than just fixing the broken, we also need to be looking at the wider issues of climate change and peak oil … I have thought for a long time that NZ has made a big mistake in closing down some of the industries that we used to be almost self sufficient in before … like the clothing industry. We have closed down production and lost the highly skilled machinists when production was first outsourced to Fiji and then to Asia. We have lost the ability to make trains right here in NZ with the closing down of railway workshops in Chch and Dunedin – so now we have to wait years for new small gauge train carriages to arrive from Europe to help meet demand in places like Wellington. As the cost of international transport becomes higher and higher, it will once again become financially feasible to manufacture a diverse range of goods inside New Zealand. We did it once, we can do it again. As Helena said, the danger is in getting to the point of being producers of mono crops/products …. the last thing we ever want is for NZ to become one massive dairy farm …. and right now, that is the way we are heading. Great review, Nat. Let’s hope that it’s people and not just developers who are heard when decisions are made on how ChCh will renew itself. Previous Previous post: What is cultural analysis?